The vessel CAPTAIN MICHALIS in Tilbury on 2/88. RWJ ? 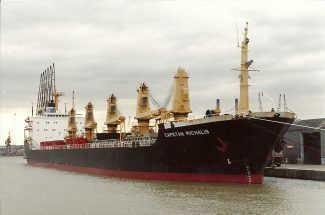 The bulk carrier CAPETAN MICHALIS (note spelling), was built in 1981 and was of 15,819 tons gross, 28,600 deadweight. It had started life as VASILIKI, and was bought by Yemelos Brothers, of Piraeus, Greece, in 1985, and renamed CAPETAN MICHALIS, with the Yemelos’ subsidiary Varma Marine Enterprises SA, of Panama, although it flew the Greek flag. When photographed by Jack, the vessel had arrived at Tilbury on 28 February 1988 from Townsville, Australia. Occasionally, some vessels stay with Greek owners for many years, and this was true of CAPETAN MICHALIS. It was sold by Yemelos in March 2011 to Al Fadel Shipping, of Tripoli, Lebanon, and was renamed FISHER D under Panamanian flag. It has done some useful trading for its Lebanese owner, but now, as a matter of topicality, at 1014h on 27 August 2014, it was anchored off Alang, India, awaiting delivery to breakers.